The capital of Lithuania, Vilnius, is the ideal size for active travel feet who want a city that can be wandered around with nothing more than leg power. 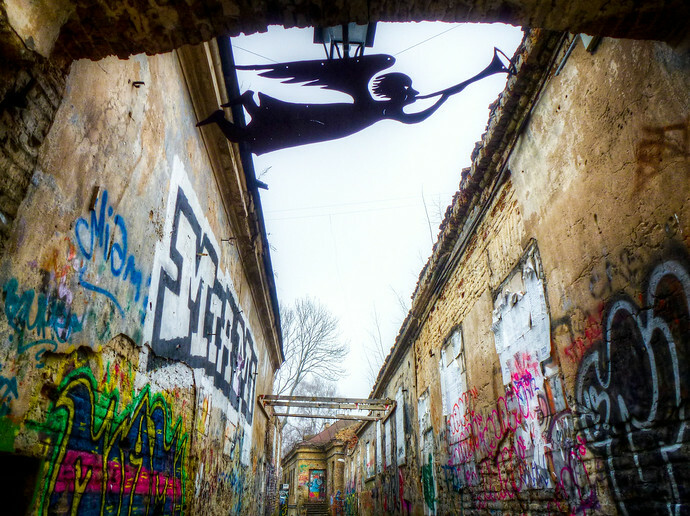 Like 2 to four minutes in Dubai, Vilnius is small enough to be thoroughly explored on a short day or two trip but leaves enough behind for a subsequent visit or longer stay. Here’s how to best introduce yourself to this Baltic city of 540,000 people. Vilnius is really refined almost to its edges, except where taxi drivers meet Vilnius International Airport. The majority will gleefully try to charge you triple the normal rate to get into town and while there are airport shuttles available, an honest cab is too inexpensive plus convenient to pass up. One quiet way to beat those shady taxi drivers is to call ahead to your hotel or hostel to have them send a cab for you. Speaking of hostels, I can highly recommend Jimmy Jumps House which is comfortable, clean, and close to town. Here’s my full review of Jimmy Jumps House with more details. When walking around generally one wants to see unique – and brick buildings with straight edges in Europe just isn’t it. 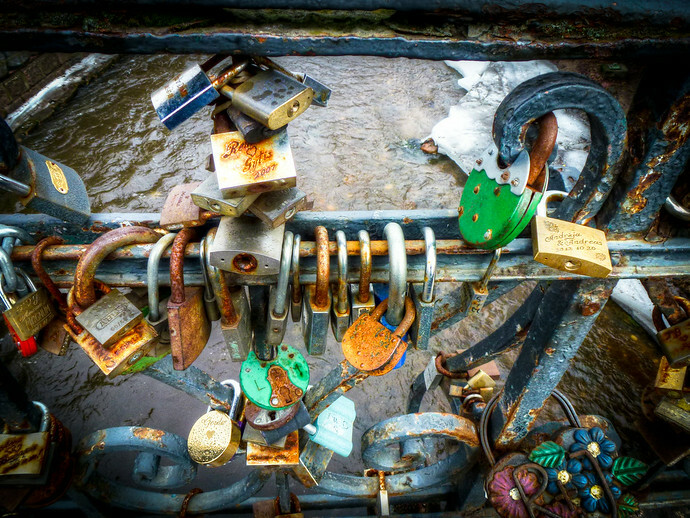 You’re better off starting with Uzupis, literally “across the river” in Lithuanian. It’s the hippie-ish we-might-be-smoking-weed-before-painting-things neighborhood of Vilnius. Visually, it’s interesting, whether you happen to be intoxicated or not. (Keep in mind marijuana is illegal in Lithuania.) Although they don’t look inviting, many of the alleyways are colored with extraordinary talent next to pawn shops that accept Uzupis’ own currency. Yes, Uzupis is a lot like Copenhagen’s autonomous neighborhood Christiania, aesthetically and ideologically. 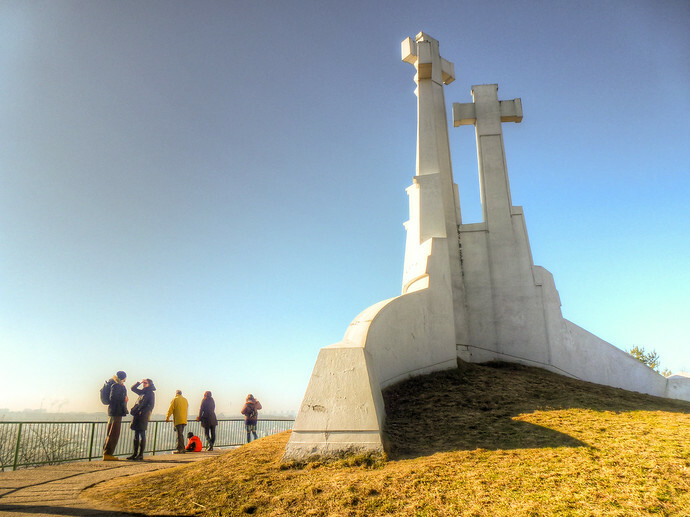 You can almost miss the Three Crosses monument, which overlooks Vilnius and offers the best views of the city. Just north of Uzupis, don’t just walk straight up, come around and stroll through Hill (Kalnai) Park first. Then, make use of the hiking trail (not the paved asphalt path) going around to the right – where you’ll be able to see the remains of the original monument destroyed by the Soviets in 1950 – the current crosses were placed in 1989. Hiking down the paved path this time leads you around Gedimina’s Tower, remains of a 13th century fort that most travelers without a specific interest can skip. You’ll end up in front of the Vilnius Cathedral whose side rooms filled with passionate praying reminiscent of Metekhi in Tbilisi, Georgia give a glimpse into Lithuanian faith. Depending on the season, there’s often a jollier atmosphere right outside in Cathedral Square next to Bell Tower; where I witnessed a student dance group practicing their moves for a large crowd. Meandering slowly south you can recharge with a snack and coffee at a place like Saskaita on Pilies Street, a part of town that captures hungry tourists and locals alike. Granted you might be thirstier for a stronger drink – like a local beer at Snekutis (the one across town toward the bus station.) 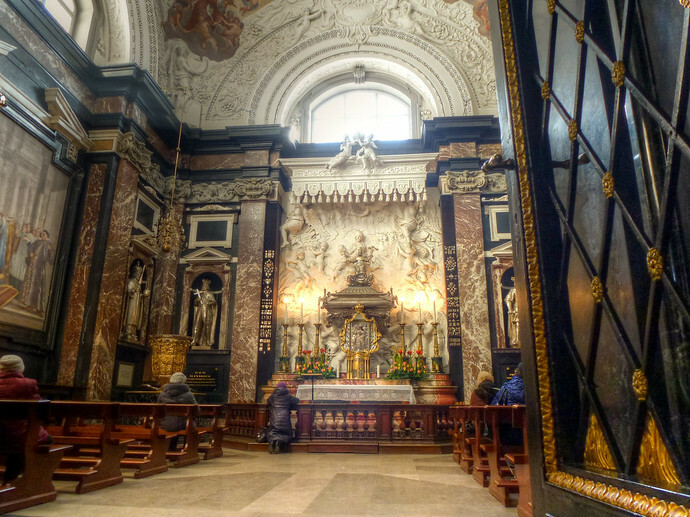 Whether you’re leaving town on to nearby Latvia or staying for a few more days, much of Vilnius is accessible within a half hour’s walk of calorie burning sightseeing. 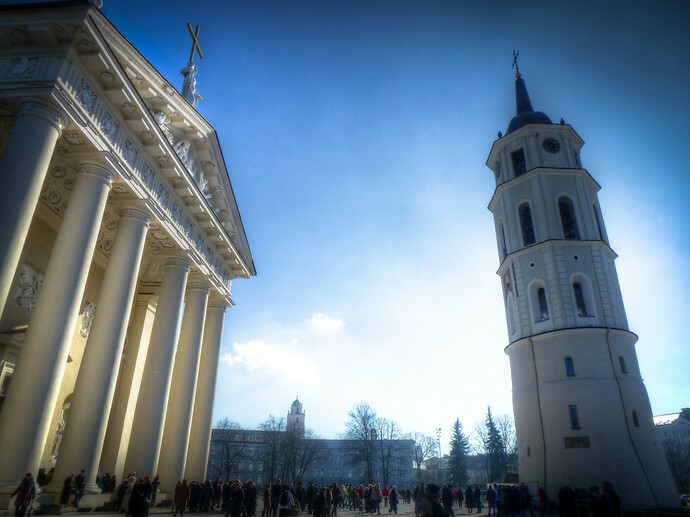 Vilnius is definitely a city worth visiting. Not to forget the Trakai Castle nearby! Looks like a great place that I should add to my European destinations. Thanks for sharing these tips. haha, without this blog I wonder how much I would remember about many places! 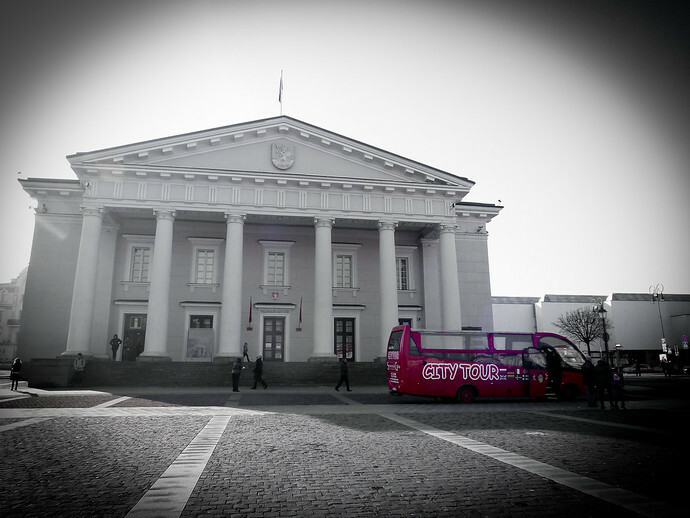 Vilnius is a beautiful city in stark contrast to the countryside outside the city. If you go back I can really recommend Cigar House in Vilnius. Great lounge and a nice place to be even if you do not smoke (that means if you do not mind smoke). I’ll keep it in mind certainly, I appreciate the recommendation! Thanks very much, I hope you have a great trip!